It looks like there may be an issue in Apple's turn by turn Maps application which is part of iOS6. 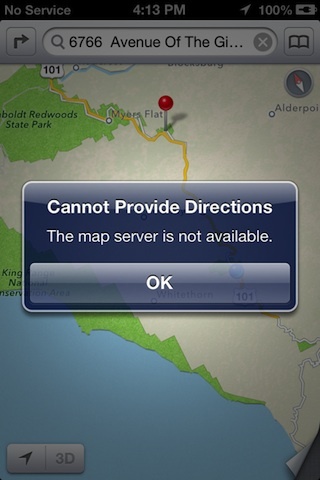 When you are first starting turn by turn navigation, iOS6 Maps sends the request to Apple's servers who in turn send back the directions to follow. If you are in a "No Service" area, you cannot start turn by turn navigation. If you already started turn by turn and you happen to drop out of cell coverage, that still works, just no starting a new route.